The Gurdon Light is one of the better-known, and examined, cases of "ghost lights." 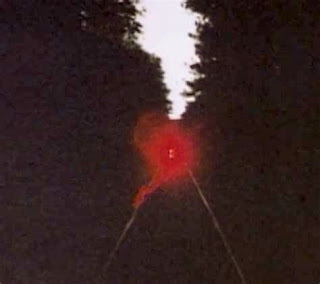 First reported in Gurdon, Arkansas (US) around 1931, the Gurdon Light is seen over the railroad tracks in the small town in Clark County, Arkansas. It is clearly visible, and attracts flocks of spectators -- especially around Halloween. This photograph was taken in 1994 by the immensely popular US TV show, Unsolved Mysteries (see sidebar). It was one of the first photos of the phenomenon considered "credible" by the scientific community. Other photographs and footage of The Gurdon Light captured both before and since 1994 have taken on added significance, but I chose this one due to its historical import (and Fair Use). Ghost Lights go by many names, including faery fires and corpse candles, and have been seen across the world for centuries. They seem to be most prolific in Welsh legend, but are far from unique to the UK. Prevailing theories explaining the Ghost Lights phenomenon include magnetic fields, mineral deposits, and the infamous "swamp gas." While some instances are known to be manufactured (usually by, and for, criminal means), there is no official explanation for Ghost Lights. Arkansas' Gurdon Light remains unexplained.